General view of the exterior of Crystal Palace, London, 1851. Coals etc at the Great Exhibition, Crystal Palace, London, 1851. Machines displayed at the Great Exhibition, London, 1851. Area representing India at the Great Exhibition, Crystal Palace, London, 1851. Area showing flax at the Great Exhibition, Crystal Palace, London, 1851. Agriculture stands at the Great Exhibition, Crystal Palace, London, 1851. Stand showing furs at the Great Exhibition, Crystal Palace, London, 1851. 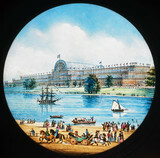 The Crystal Palace, London, 1851. The Great Exhibition, Hyde Park, London, 1851. Interior view of the Great Exhibition, Crystal Palace, London, 1851.